An anti-slip floor coating will make your locker rooms safer than ever before. Locker room flooring sees a lot of dirt and grime, so it’s important to be able to clean it thoroughly. Old cement and tile can be difficult to maintain, making it easy for dirt and bacteria to linger in their pores. At PolyTek Surface Coatings, we design our high-quality, durable products to keep your athletes clean and healthy. Product Warranty: We back our products with lifetime and 5 year warranty to protect your investment. Expert Installation: You can be certain that your flooring will be properly installed with our certified and trained installation specialists. Custom Colors: If you want your locker room flooring to match your team colors, you can easily choose from a range of standard and custom colors. Easy Cleaning: Our low-maintenance locker room and shower floor coating will keep your floors free of mold and mildew build-up. 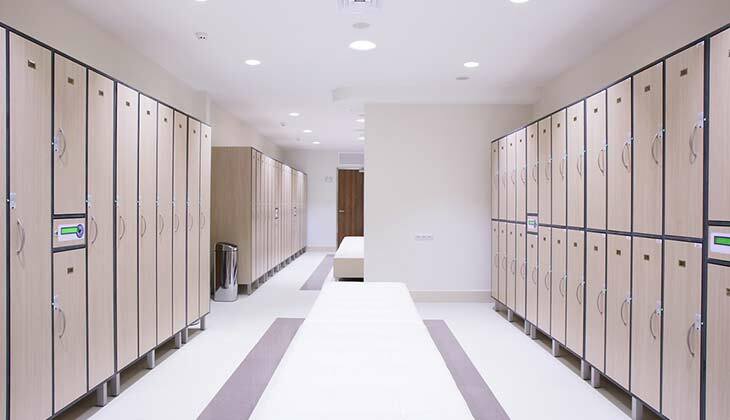 Safety: Locker room shower flooring can get slippery, and our anti-slip epoxy floor coating will make your space safer. If you’re in need of a high-quality coating for your locker room, trust PolyTek Surface Coatings to get the job done. From locker room floor coating to commercial kitchen floor coating, we offer a range of products to fit your space. Contact us today to request an estimate. Call now at (507) 380-7655.